When a four-year-old Cherokee girl was reunited with her adoptive parents on Monday night, it potentially signaled the conclusion of a custody battle that entangled governors from two states and worked its way up to the U.S. Supreme Court. But for many Native Americans, the questions raised by the case over tribal adoptions, heritage and child welfare, remain unresolved. "Baby Veronica," as the girl is known, was an infant when her birth mother, who is not Native American, gave her up for adoption to a white couple, Matt and Melanie Capobianco, in South Carolina. Two years later, the child was removed from their home when her biological father mounted a legal challenge. The father, who is part Cherokee, based his suit on a 35-year-old law governing Native American adoptions, drawing support from Native American activists and setting off a prolonged custody fight. 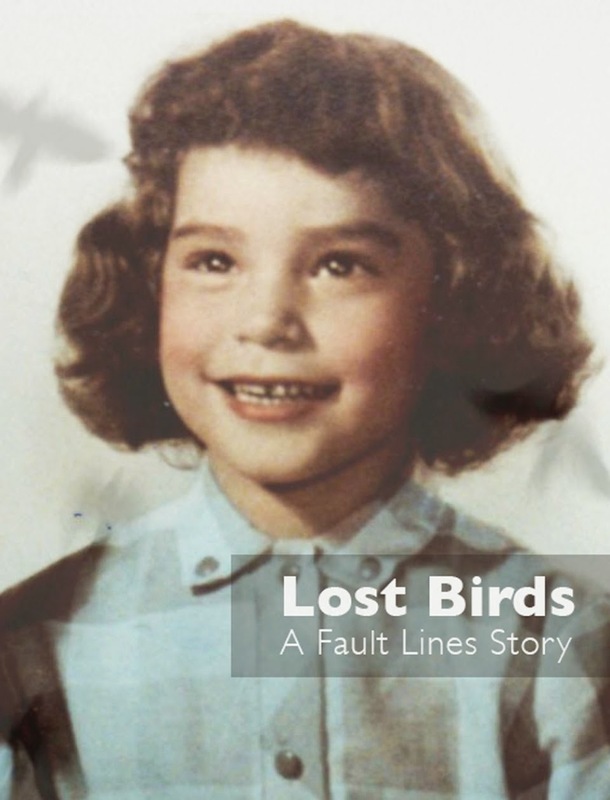 Since then, Veronica's plight has refocused attention on a practice - once government-sanctioned, but now condemned - of placing Native American children with families outside their culture. Some who were adopted this way decades ago, such as Anecia O'Carroll, 51, said they have never fully recovered from the experience. 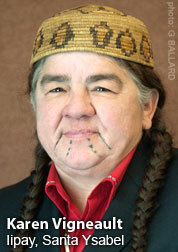 "It is a tremendous wound of loss - culturally, spiritually," O'Carroll said of growing up outside her tribe. Like many other Native children of her generation, O'Carroll said she was placed with a white family, away from her Alaska Alutiiq tribe. She later found her birth mother, who described being coerced into giving up her baby in the early 1960s. "She cried and cried, and looked at me, and she thought my skin looked like honey," O'Carroll, 51, recounted her mother telling her years later. "The last thing she said to me was 'I wish you a rainbow life,' and then she let me go." The case of Veronica, who is 3/256 Cherokee, centered on the Indian Child Welfare Act, passed by Congress in 1978 in response to Native American protests. The law established that it was best to keep Native children with their families or, short of that, within their tribe to preserve their culture. In June, the U.S. Supreme Court ruled that the law did not apply in Veronica's case, in part because her birth parents were not married and also because her biological father, Dusten Brown, never had custody. Her adoption by the Capobiancos was finalized the following month. But Brown refused to hand over Veronica and the girl remained with the Cherokee Nation in Oklahoma until yet another court weighed in on Monday. Hours later, she was placed back with the Capobiancos. Cherokee Nation officials said on Tuesday that Brown would have to decide whether to continue to pursue his adoption challenge, which is still being appealed. 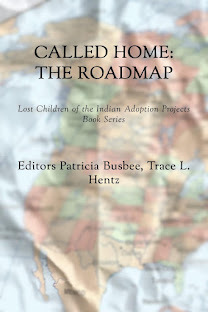 Starting in 1958, the Indian Adoption Project placed Native American children in non-Native homes, in what it said was an effort to assimilate them into mainstream culture and offer them better lives outside impoverished reservations. 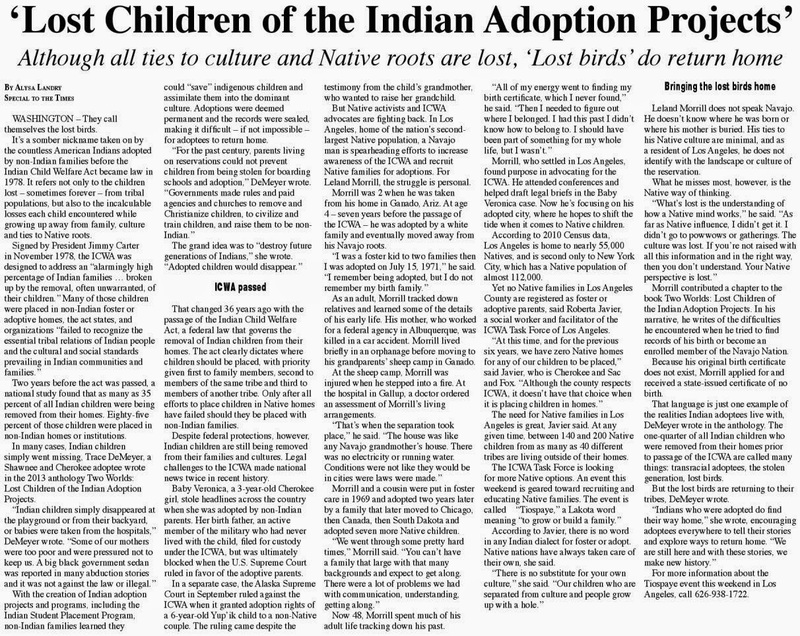 The project was run by the U.S. Bureau of Indian Affairs, a federal government agency, and the nonprofit Child Welfare League of America, in partnership with private agencies. In some cases, young single mothers were persuaded that they could not provide as good a life as a more affluent white family, and their babies were signed away even before they were born. In other cases, families voluntarily gave up their children, or abandoned them to be taken in by authorities. 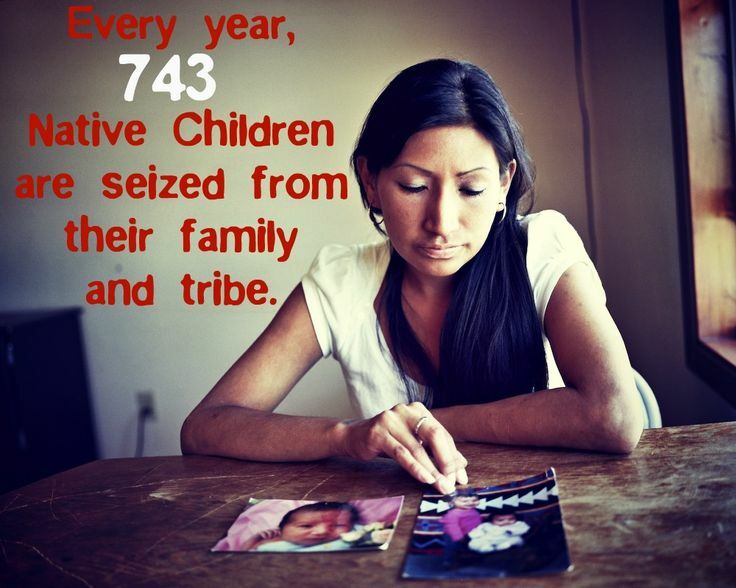 Around the time the Indian Child Welfare Act passed, more than a quarter of all Native American children were being placed in out-of-home care - eight times the rate of non-Native children - and about 85 percent of them went to non-Native homes, according to a 1976 study by the Association on American Indian Affairs, a non-profit group that advocates for Native Americans. Some of the children's adoptive birth certificates listed them as white. "It was all under the guise of, you know, they're doing us a favor," said Adrian Grey Buffalo, 55, a South Dakota Sioux who said his mother had been tricked into giving him up. The Child Welfare League of America eventually apologized for its role in the mass adoptions, issuing a statement in 2001 calling them "catastrophic and unforgivable." Leland Morrill, 46, said his Mormon adoptive parents did a good job raising him after he was removed from a hospital at age 2 by a caseworker who didn't believe his life on a poor Navajo reservation with elderly relatives was safe for a child. But he regrets that he and his cousin, both adopted by Stanley and Gwena Morrill of Utah, were "separated from anything that we would have known if we had stayed around our culture." The Morrills said they never witnessed any coercive adoption practices and that Leland came to them with scars, injuries and other signs that pointed to an unhealthy environment. Gwena Morrill said factors other than heritage need to be considered. "Being born to a person who is part Indian is not a valid basis, in my opinion, to raise a child in an Indian culture," she said, referring to Veronica. Many Native Americans, however, say the link is vital. "When she turns a teenager, she's going to come looking," said Diane Tells His Name, a California Lakota who said her adoptive parents raised her to believe she was white. "That blood, I'm telling you, is so strong. It's racing through there like a buffalo," she said. "She'll want to come back home." This is a form of genocide. Yes, Vio. You are absolutely correct.